We dodged a spring snow storm overnight. That’s what it feels like, anyway. Obviously, we didn’t do any dodging. We stayed right where we are and didn’t flinch, while the white stuff slid past a little bit to the south of our region. Too bad for those folks. I guess we all get a turn at weather adventure. 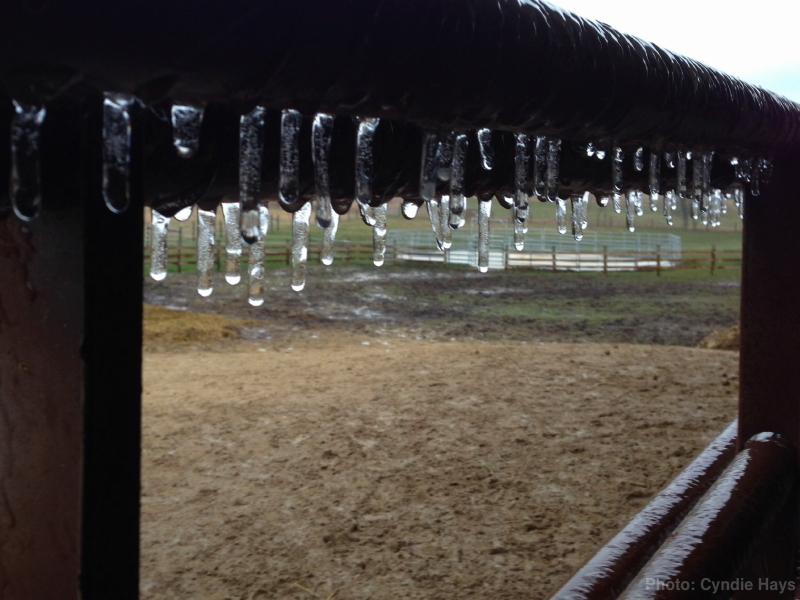 This leaves us with the adventures of watching snow melt. I am fascinated by the way anything of color absorbs the solar energy and melts a perfect pattern into the otherwise reflective snow. Meanwhile, that reflective snow mass is radiating an amazing chill that offsets some of the best efforts of warm air to tip the balance. Taking a walk across the crusty surface in our open fields feels like a trip down the frozen foods aisle in the grocery store. The sun is shining warmth, but, brrrr, there’s a cold draft wafting up from everywhere! We can now see where my winter plowing has torn great gouges of turf from the edges of the driveway and sprayed rocks in a wide array across the grass. New cracks in the old asphalt of our neglected driveway look another significant degree decayed. I’m amazed anything survives unscathed. The concrete apron in front of the house garage looks to have moved its slope another degree in the wrong direction, inviting the snowmelt and rain runoff to drain toward the foundation instead of away. 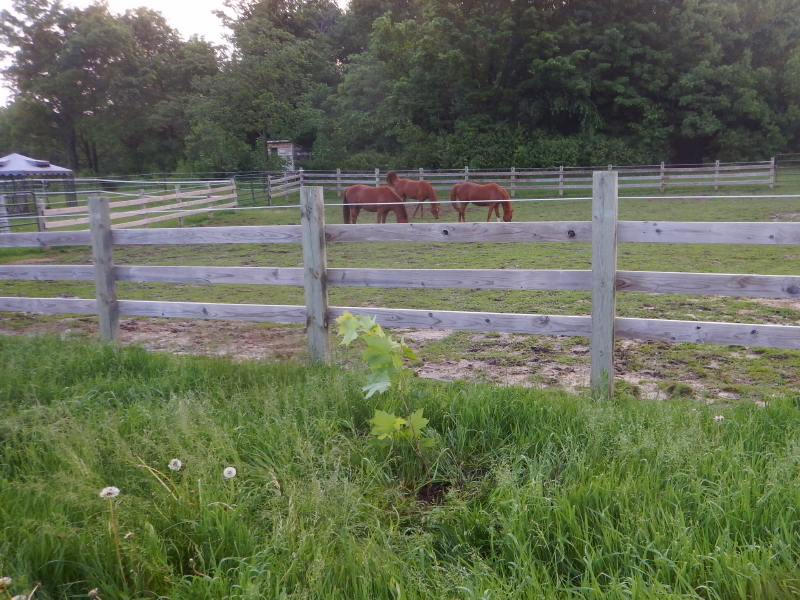 And in terms of heaving earth, the waterer for the horses in the paddock has shifted dramatically off-kilter so that one side overflows and the high side holds inches less water. Where is all the hope and renewal of spring? It’s waiting. Biding its time beneath the surface. We must be patient. It will come. The trillium we have transplanted will bloom again. 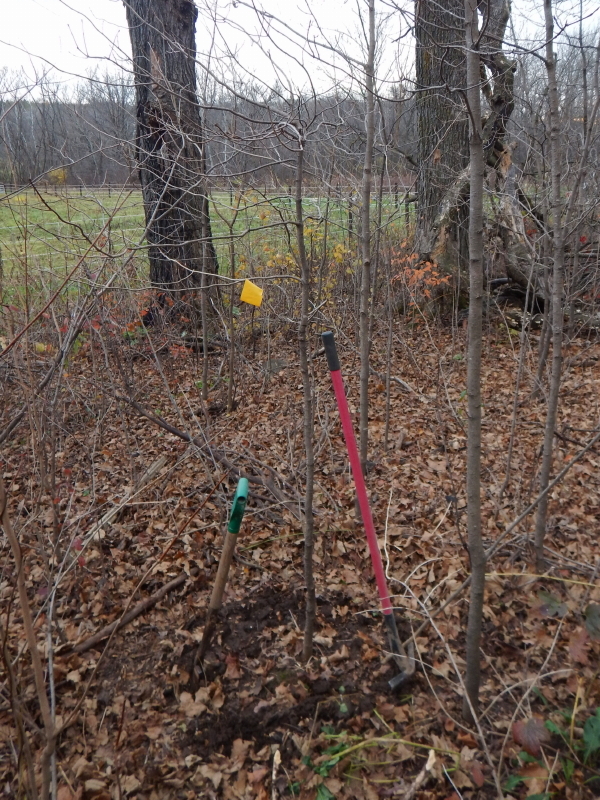 Volunteer maple trees will sprout in mind-boggling numbers everywhere we turn. It has snowed and then melted again, so the ground here is well saturated, but not frozen. 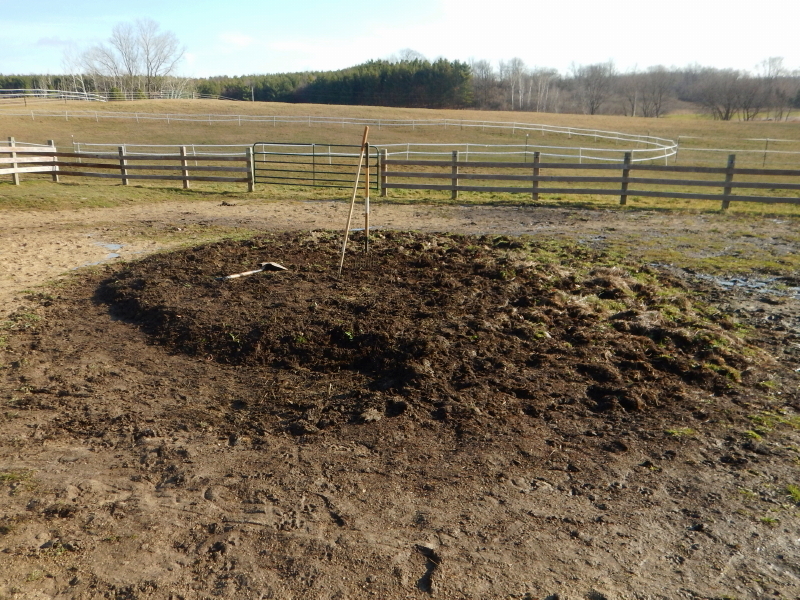 It was time to tend to the raised circle in the paddock before the earth becomes hard as rock. It’s been a year since I last shaped it and the definition was fading to the point it wasn’t really performing as a raised perch above the wet. Try as I might, I am not able to pack it firm enough to support the weight of the horses, but if I keep reshaping the circle as they stomp around on it, eventually it will become what I envision. It worked in another spot that we created when the excavator was here digging out our drainage swale. That flat mound is visible in the corner of fence in the picture above on the left. Since it was made from slabs of turf scraped from the swale, there was a lot of grass in it that seems to have added a lot of stability. 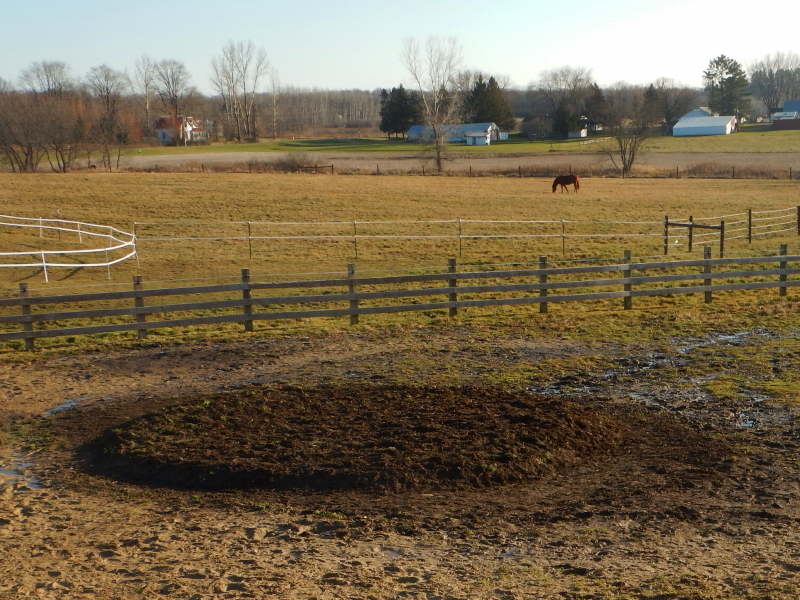 The circle I am creating in the middle has a lot of layers of hay which the horses’ hooves punch through with ease. It becomes a pock-marked uneven surface. On the plus side, residue from the hay includes plenty of grass seed that wants to grow and will help firm up the surface over time. If I keep tending to it, I’ll get what I’m after. In the end, it’ll seem like it’s always been that way. Good thing I’m a patient person. Dezirea supervised my progress while Legacy grazed from the slow-feeder behind her. 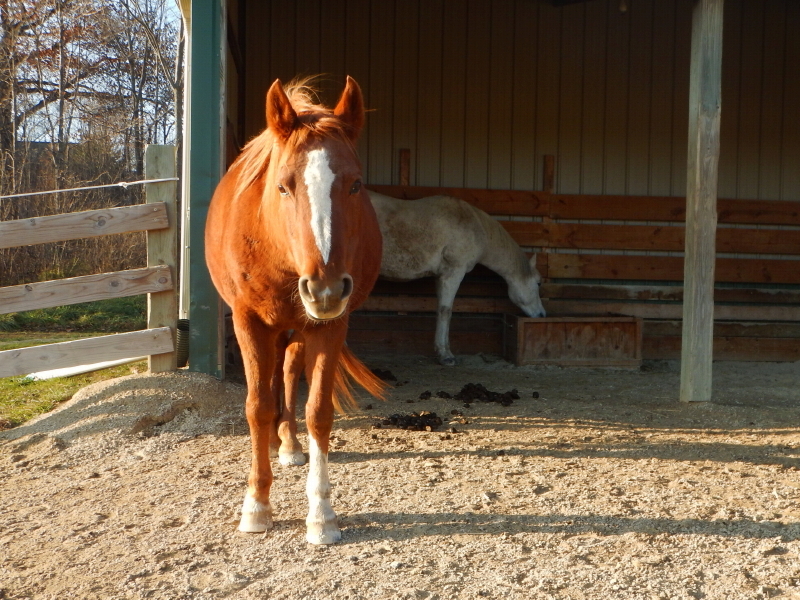 I get the feeling the horses recognize what I’m trying to create, and they approve. 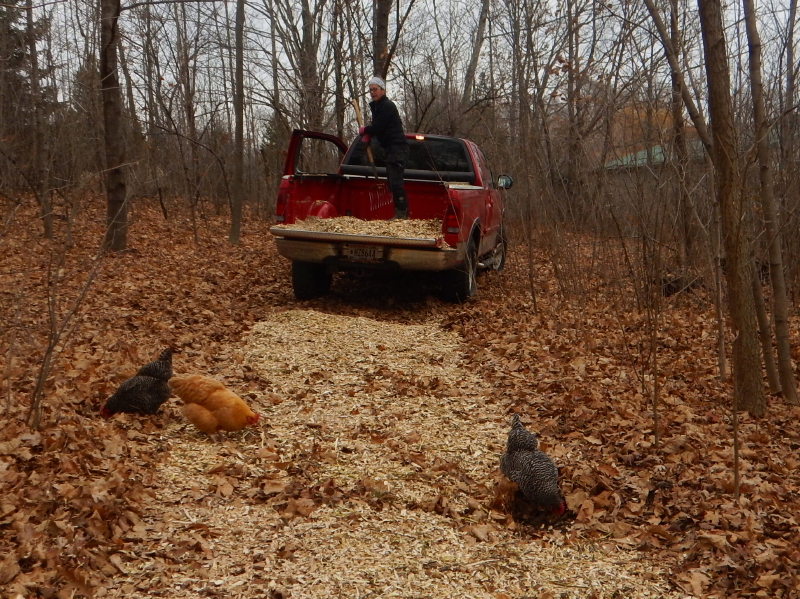 When I came out from taking a lunch break halfway through the project, I found Cayenne standing beside the circle on the ground I had just raked flat. It was as if she wanted to be close to what I was doing, but didn’t want to mess it up by stomping on it too soon. I appreciated her discretion, but in no time, the results of my reshaping will be hard to perceive amid the multitude of hoof prints. Watching the horses all day long, you get the impression that they don’t really move very much. They don’t appear to cover much ground in a day. However, if you survey the ground over time, it becomes evident that there isn’t a spot where they haven’t been at one time or another. In the long run, they are definitely shaping the ground of their confines. Despite a strong inclination I have had to just shut up about the tree transplanting —at least until we finally meet with success in this one particular spot— I can’t stop myself from reporting the story. We have waited for most of the summer to pull out the previous dead tree from the center of the labyrinth, even though it was long ago obvious it hadn’t survived. There was no hurry, because our plan for the next attempt was to wait until the trees drop their leaves before trying again. The trees have dropped their leaves. Earlier in the summer, when we knew we would need to try again, I searched through the saplings beneath the magnificent maple tree that has been my inspiration all along. I like envisioning what one of the offspring of that beauty will look like in the middle of the labyrinth garden when it reaches the same maturity of years. I selected and marked a tree that I liked. Then we waited. 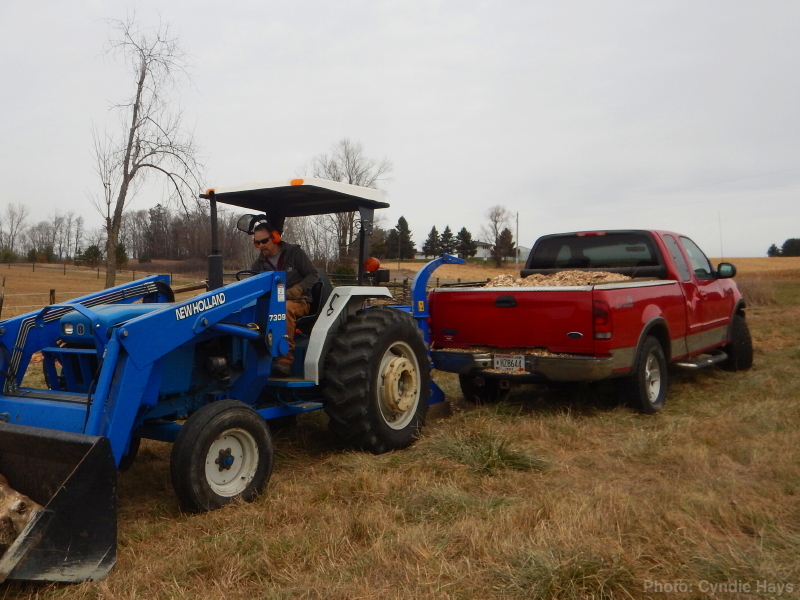 Yesterday was the day we picked to execute our fourth try at transplanting one of our maple trees to the center of the labyrinth. Cyndie dug out the hole in preparation and when I got home from work, we set about the challenging task of extricating our selection from the spot where it originated. It didn’t want to come out easily. With daylight fading, we finally wrested our new hope from the earth’s grasp. 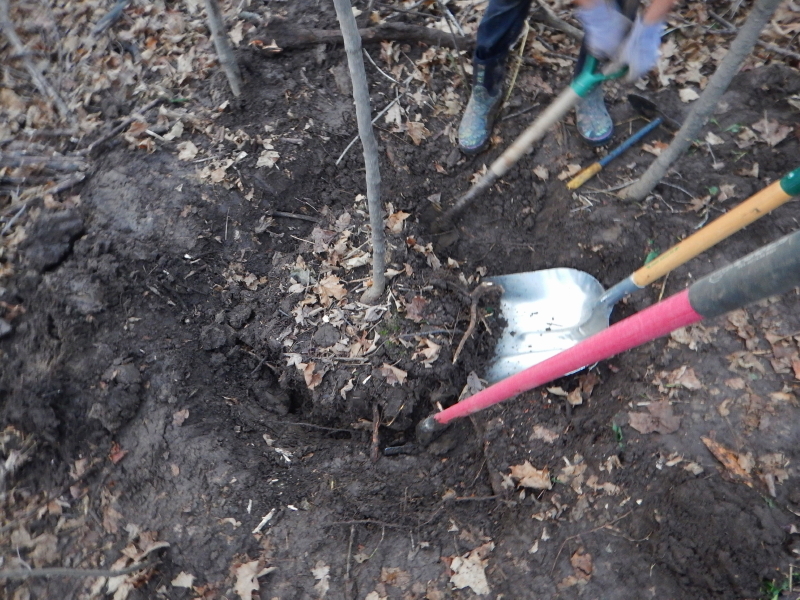 Using a wheelbarrow, we transported the tree to the labyrinth and slid it into the hole. With all the tender loving care we could muster, we prepared the new home for this tree. Now we wait. Nature needs to do the rest. And if it doesn’t take, I’m just going to keep trying, all the while debating whether I will do so covertly, or choose to continue chronicling the possible repetition of failures. My patience has been tested the last few weeks, waiting for three different contractors to make appearances on our property. 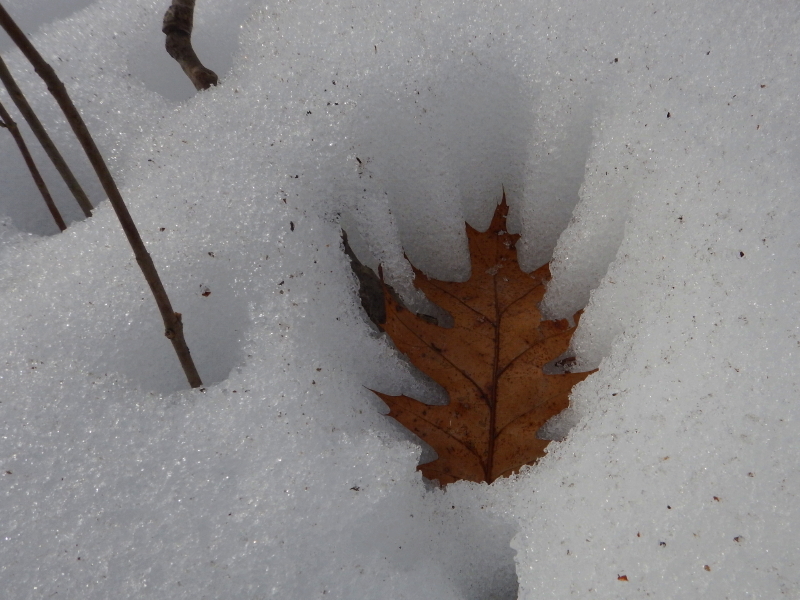 Unfortunately, nature isn’t going to delay the onset of winter just because my projects weren’t completed. Completed seems like a humorous concept, since I can’t even get people here to start. They all claim the reason they can’t make it is that they are too busy and behind schedule. Yesterday, I received a token visit from landscapers who will put in drain tile to route water around the paddocks, in hopes of keeping them from becoming such mud pits. It was “landscapers” plural, because the first one was so over-busy through the end of the year he needed to contract it out to a friend. They took some final measurements and said work should be able to start next week. I can only hope. It felt a bit like the experience I often have in a visit to the doctor. I check in to let them know I arrived at the time of my appointment, and take my place in the waiting area. After what seems like way too long to be waiting, I start getting agitated. When that feeling starts to morph into anger, a nurse pops out and calls my name. That resets my angst, and I am happy my turn has finally arrived. Except, it hasn’t. I eventually discover that all they have done is move me from the outer waiting area to an exam room to continue waiting. It’s a great system, because I tolerate a lot more waiting when it is broken up by little moments of faux progress. It would have been an intolerable wait, had I spent the entire time in the outer chairs. Broken into two stages —the second one feeling like actual progress— helped me accept the overall total wait-time without making a fuss. It feels like the landscape contractors finally made an appearance yesterday to reset my angst and make me feel good about them telling me the work should be able to start next week sometime. Once again, it works wonders for me. My previous anxieties have been reset. I’m happy with their latest promise. Here’s hoping they are able to live up to it.